I have showed Casa Jaguar yesterday to a lady and her friend. When walking around the property she asked me two times if there are snakes. I answered yes, but she should not be worried about them as within the 16 years I’m here, I never known or heard about an incident. 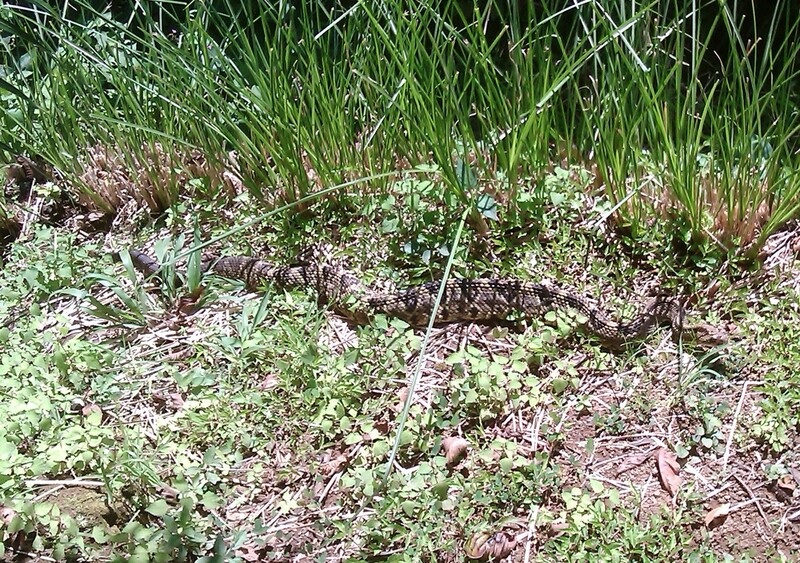 When we walked towards the waterfall at the property I saw the snake, just 3 feet right in front of me. Great camouflage this Boa Constrictor (non venomous) I though , she did not move so I made one step back and took a picture with my cell phone. The clients / ladies behind me got excited and we tried to get the dog away from the snake. Too late, the dog sniffed on her and the snake came up in the air with half of the upper body ready to strike, when I saw the rattle going I knew that I was wrong, it was a Cascavel or Rattlesnake. The dog jumped backwards quickly, then the snake stayed a few seconds and then turned around and disappeared in the bushes. Amazing to see on how close we and especially the dog came up to the snake. Back at Casa Jaguar, the owner stated that this is pretty normal, because they live here in the middle of nature. All the years nothing happened to none of the five dogs or 3 cats nor any of their guest or them. Pura Harmonia.